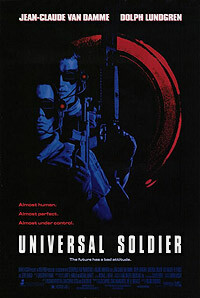 Universal Soldier (1992) - Sci-fi-central.com.  USA  1992  102m   Directed by: Roland Emmerich.  Starring: Jean-Claude Van Damme, Dolph Lundgren, Ally Walker, Ed O'Ross, Jerry Orbach, Leon Rippy, Tico Wells, Ralf Moeller, Robert Trebor, Gene Davis, Drew Snyder, Tommy 'Tiny' Lister, Simon Rhee.  Music by: Christopher Franke. Jean Claude Van Damme, like many other martial artists-turned-actors, simply cannot do much real acting. Like Chuck Norris and Steven Seagal, his acting is wooden, and Van Damme also has an accent thick enough to cut with a knife. However, sometimes even a poor actor can find a role to suit him, much like Arnold Schwarznegger as a cyborg in The Terminator. That seems to be what happened here: Van Damme found a role that worked well within his limitations, a role in which he unexpectedly shone. The movie is typical sci-fiaction fodder: Dead men are revived as virtually unstoppable soldiers. 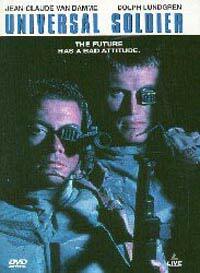 The viewer meets the two main characters in the opening sequence as soldiers fighting in Viet Nam. Van Damme's Luc Devereaux is a decent man doing his best to survive the brutal conditions of war with his soul intact. Dolph Lundgren's Andrew Scott is a psychotic reveling in the horrors around him, feasting on obscene cruelty with relish. The two opposites finally clash with predictable results: Good and evil annihilate each other like matter meeting antimatter. But these dead men are not left to rot in peace... for the military has developed a technology to recycle them as soldiers, Unisols to be exact, to be placed in harm's way in lieu of regular men. Powerful, emotionless and practically indestructible, these new universal soldiers are shown off by the brass in a difficult hostage-rescue mission, which the Unisols pull off flawlessly. All seems peachy. However, something during the rescue triggered a memory in Luc of his experiences in Viet Nam. He eventually deserts the unit, followed by the dangerous Scott, who has also recovered enough of his past to hate Luc and hunt him down. A self-serving reporter named Veronica helps Luc, at first for a story, then because she grows to care for this powerful yet childlike fish-out-of-water. She's caught in the middle when all hell breaks loose. Typical Van Damme fare... only it isn't. There's a strange charm to his character, a vulnerability and even hints of humor usually lacking in his acting. Van Damme conveys subtle emotions in his face, especially in his large gentle eyes. He's still at his best when fighting, but surprisingly good at playing this role. Oddly enough, the acting in this movie is one of its strong points, the other being special effects. The other performers are all solid, from Ally Walker as Veronica to Lundgren as the incredibly creepy Scott. The director was wise enough to work within the limitations of his leading man, so Luc's dialog is used sparingly. The fighting sequences are also well utilized, fitting in with the plot. Weaknesses include the plot, which is full of holes, and exposition of key elements, such as just how these fighting machines were created. The film at times had an abbreviated feel, as if too much information was truncated that should have been included in the story. Still, it remains overall a reasonably enjoyable film, even for non-fans of martial artists like me. 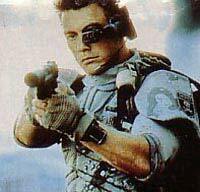 Van Damme actually fit his role and was likable as the unlikely hero. Though it's considered sci-fiaction, this movie in truth occupies a strange niche, one not easily identified. Worth watching when not in the mood for the usual fare. Review by louiepatti from the Internet Movie Database. It's loud, it's fast, it's cruel, it's funny and it's a blast. A second rate movie starring the greatest second rate action/movie star.